'Tis the season for the gooey, sickeningly sweet treat — which is perhaps the most polarizing candy ever known. Somehow it manages to be both utterly disgusting and utterly irresistible. Yes, it's complicated. 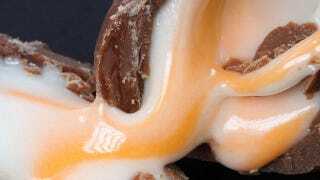 In Roald Dahl's paen to all things cocoa, "The Chocolate Revolution,", he wrote that the Cadbury Creme Egg was "the blandest and most disgusting thing" in the candy universe. He continued, "Between Christmas and Easter, Cadbury sells 350 million of these fondant-filled horrors. I won't eat them. Nobody I know eats them. But somebody obviously does, by the bucketful." Well, I'm one of them. And not because they're so amazing: next to the Peep, it's probably the most nauseating of all Easter confections, even the superior British version. Like the Peep, it probably has a few rabid defenders who hoard them throughout the year and claim they're "even better" when stale. But the first Creme Egg, like the first robin, means Spring. Forget the calendar; the seasons haven't changed until that chalky anemic brownness has coated your tongue and your teeth are aching from contact with the sallow epicenter. More to the point, it means the forbidden. Like all things fun, Creme Eggs were forbidden me and my brother. Having seen one on TV — and on TV the yolk and white are vibrant and distinct, not the sullen lump of reality — I was enraptured. I lobbied hard for four years before the wonderful morning when I saw the twinkle of purple and red nestled in green plastic grass: a single creme egg. Even then, I knew it wasn't good: I told myself it was, that it was worth four years' wishing and hoping, but even to an 8-year-old, it was somewhat sickening. The first bite, mostly chocolate with just a hint of filling, was okay — but by the time you reach the center there's no pretending. Nevertheless, it retained a certain forbidden glamour. I have a strong memory of being in Middle School and seeing a table of popular girls, sleek and immaculate and glossy in Michael Star tees and chunky black shoes (this was the 90s) in the cafeteria: each was lunching on a Diet Pepsi and a single Cadbury Creme Egg. By this age, of course, I was capable of buying my own. But the experience remained sacrosanct: each spring I would buy one, from the local stationery store, and savor it slowly. Later, in other countries, I learned that you could could buy a pack of three miniature eggs from vending machines on subway platforms. This was initially exciting, but later their sheer ubiquity began to depress me. Besides, the ratio wasn't the same: with that much more chocolate to filling, they weren't nearly sickening enough. As we aged, so too did the Creme Egg. First came the dark-chocolate egg, a sinister attempt at sophistication. The "caramel egg" meanwhile, possessed the virtues of a Caramello — but had none of the magic of the original. Mint eggs, white chocolate eggs, "twisted" eggs, double-chocolate eggs...while I can't resist their novelty, they're not creme eggs. Today, I ate my first of the year. It was repulsive, and wonderful. I don't mind that they're smaller than they used to be — if anything, it's a relief. That much joy, privation, excitement, envy and nostalgia — not to mention corn syrup — is a lot to swallow.